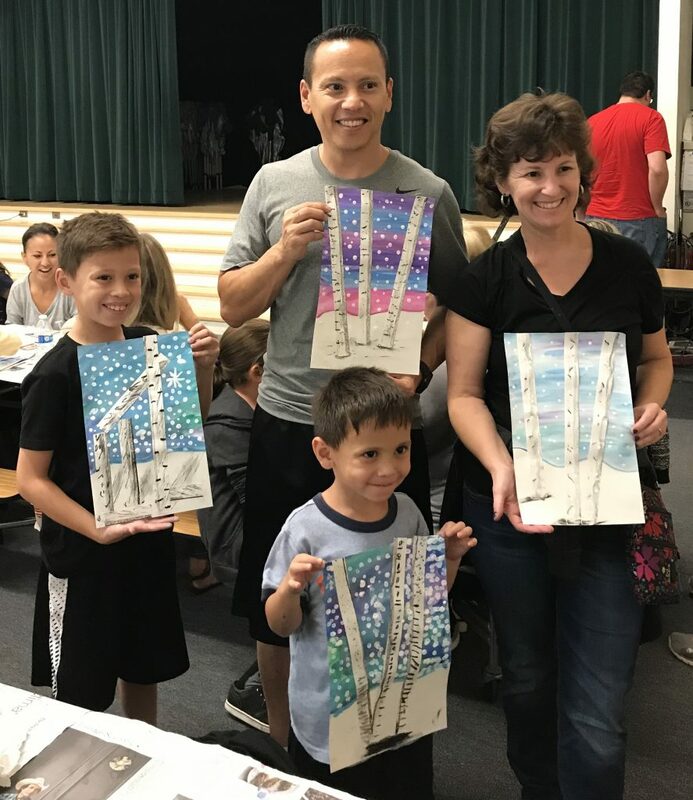 Family Art Nights are an opportunity for parents and students to experience art together. Families choose from one of three lessons, each based on a different famous artist. The first part of the lesson is an introduction to the artist’s life and samples of his or her work. Next, there is an explanation of the evening’s lesson, which includes a warm-up with the materials to be used. Then, parents and children each create their own masterpiece using the artist’s work as inspiration. Three Art Corps leaders teach the lessons. The leaders set up the lesson, teach the lesson and clean up. The lessons last one hour. Set up begins 45 minutes beforehand, and cleanup requires an additional 30 minutes after the lessons are over. We have found that keeping the number of participants at 100 or fewer provides the best experience. Each year, lessons are selected that offer a variety of materials. Lessons also vary in complexity, allowing children from pre-K through late elementary to participate. Dates are being set now. Watch for a sign-up flyer coming home as your school’s date approaches. Don’t see your school? Check back later to see if your school has been added to the schedule. These are the lessons we will be offering for 2018-2019. 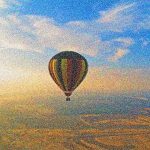 Man’s first successful flight into the sky was in a hot air balloon in 1783 in Paris and the science of air travel began. One hundred years later Georges Seurat was exploring a scientific use of color in Paris, later called Pointillism. He painted tiny dots of pure color next to each other and let the viewer’s eye blend the colors, rather than using his brush to physically blend them on the canvas. He often used dots of complementary colors to make the paintings more vibrant. 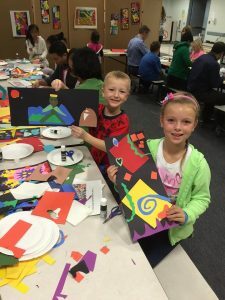 At Family Art Night, we will play with dots of color like Seurat and paint our own colorful hot air balloon in flight. 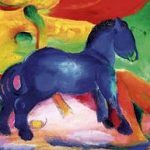 The colorful works of both the German Expressionist Franz Marc and Native American artist Mitch Robles inspired a Fauve interpretation of the beautiful Paleolithic painted cave in the South of France. The Cave of Lascaux is famous for its prehistoric paintings of animals, hunts and wars dating back 17,000 years. 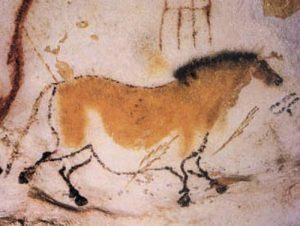 At Family Art Night we will create our cave painting using soft pastels on colored paper. 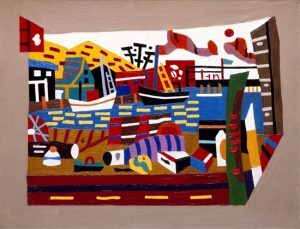 Stuart Davis created an American style of Cubism in his paintings of landscapes like Gloucester Harbor or New York City. He reduced familiar landmarks and structures to flat, geometric shapes arranged in colorful patterns. He fractured space into multiple perspectives, but it was important that something of the subject be recognizable to the viewer. 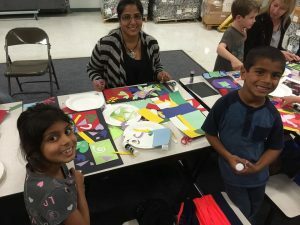 At Family Art Night we will create a landscape featuring San Diego landmarks using color construction paper and scissors.